Today found us driving back east following the route we took toward Chiricahua a few days ago. Our original plan had been to visit Fort Bowie that same day but we lingered at the magnificent rocks for too long. 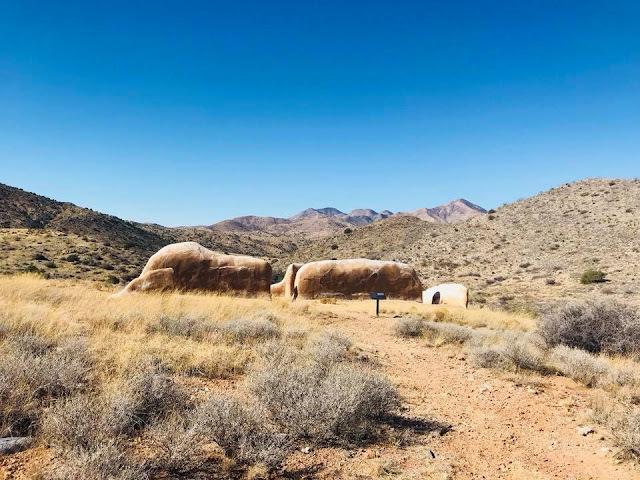 Fort Bowie is a remote National Historic Site. 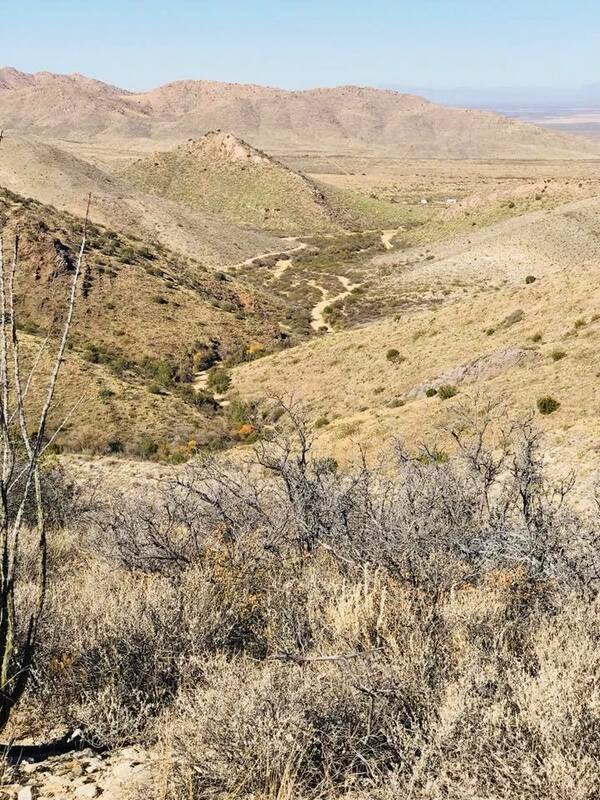 The access point on Apache Pass Rd is a trail head with a 1 ¾ mile walking trail to the Visitor Center. Remains of the Fort Bowie Hospital. We took a wrong turn through some rough dirt roads and ended up at the Ranger Station, but had a shorter trek. Apache Pass where Fort Bowie sits had long been a traveling route between the Mountain Ranges. The pass was the flattest route and also had a source of fresh water in Antelope Spring. Spanish explorers walked this road. The Butterfield stage line traversed this pass to deliver the mail. There was no military presence here until 1862 with the building of Fort Bowie. 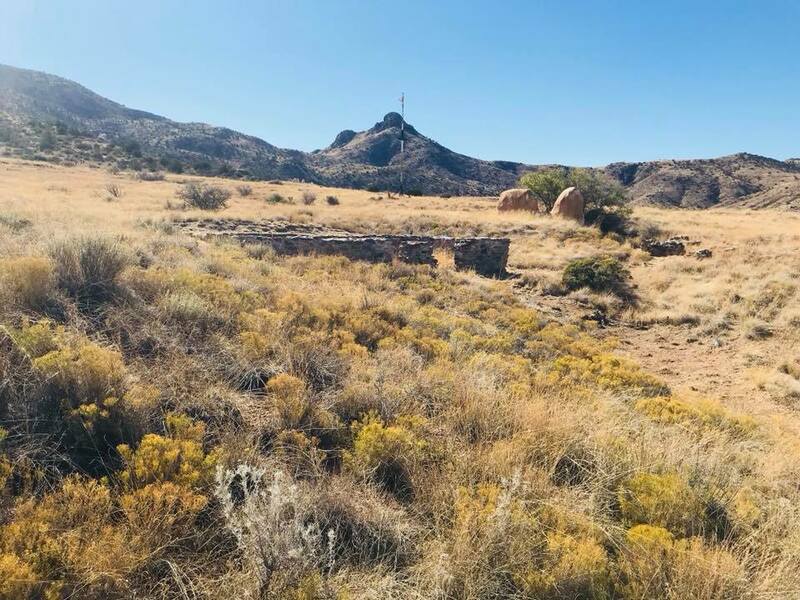 Fort Bowie was commissioned to provide protection of the pass and those using it from the Chiricahua Apache lead by Cochise and then Geronimo. 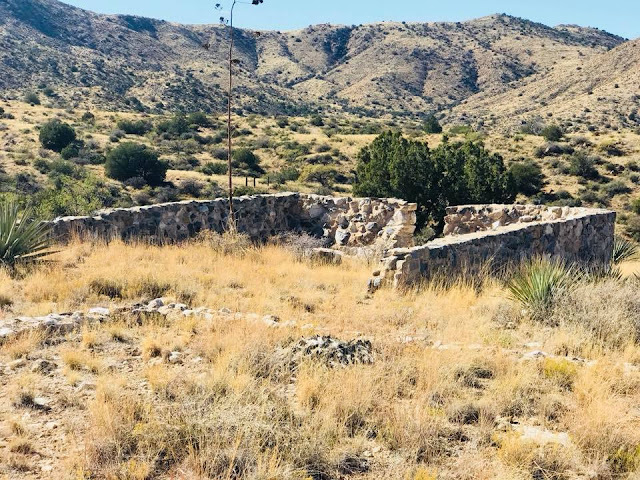 The Fort was a very basic outpost for the first few years but by 1886 adobe structures had been completed with separate quarters for officers and enlisted men, a post hospital, storehouses, corrals and a commissary. The fort stayed in service until 1894 8 years after Geronimo and his band surrendered and were exiled to Florida. The fort no longer had a purpose with the Apache warriors banished to reservations. Soldiers have been moved to National Cemeteries but civilians remain in the cemetery at Fort Bowie. The Visitor Center is small but includes exhibits about the fort, the region and about communication. Heliographs were used extensively in this remote area. The US Army Signal Corps adopted the British invention to use in the American Southwest where the sun shines more than 300 days a year. The Heliograph works using mirrors to reflect sunlight and a keying system that interrupts the light flash in a series of dots and dashes that correspond to Morse Code. Arizona and New Mexico once had 23 Heliograph stations about 25 miles apart. Fort Bowie and Bowie Peak were in this chain of communication. 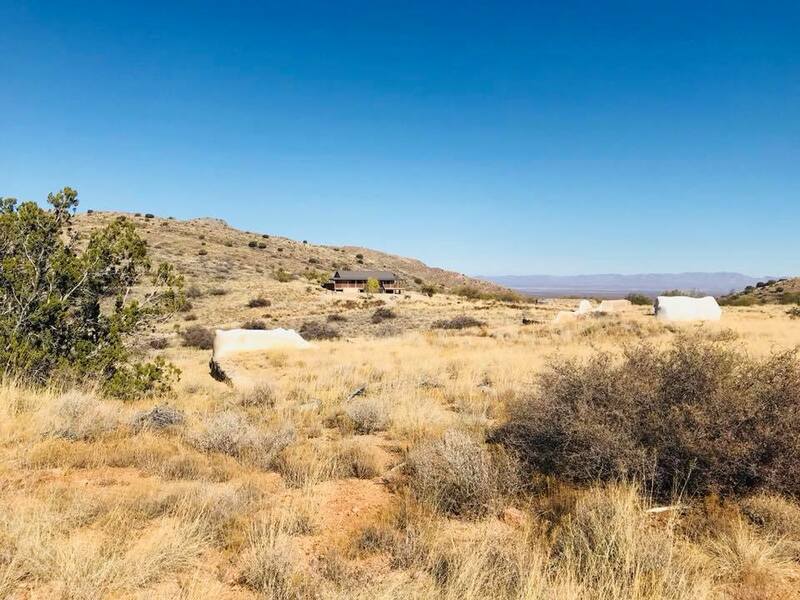 We enjoyed visiting this remote outpost of the American West. Most of the fort has disappeared with the passing of time. Portions of adobe walls remain to show us where buildings, corrals and the water cistern once stood. The Ranger at the Visitor Center recommended the Overlook Ridge Trail to give us a birds eye view of the pass. We set out behind the Visitor Center and started to climb. The views from the top of the ridge were as beautiful as described. You can still see tracks through the pass and imagine wagons and coaches trying to climb the hills. 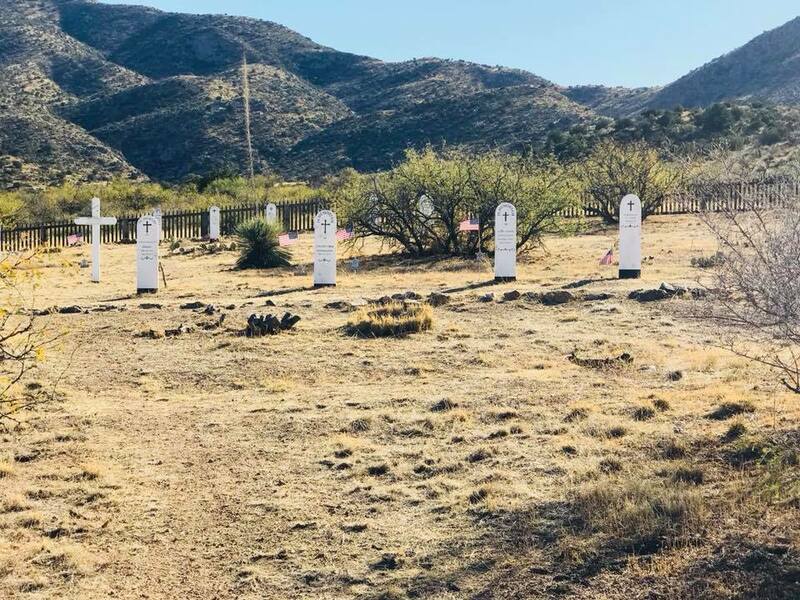 The downward trail took us past the Fort’s cemetery and by Antelope Spring in a gentle 3 mile loop. We returned to the car, tired and dusty but happy to have made the effort.